New section added with route suggestions. These are just tasters - follow the links to the full guides at RoadTrip America's new route planning area. Read the full series of Thody's American Adventures on RoadTrip America. "one of those rare travel writers who excel at stowing us along on his adventures." "could give Bill Bryson a run for his money"
"make(s) the scenery come alive"
"I laughed, I cried, and best of all, I was with you on your journey"
"A wonderful piece of writing"
Having spent the previous two and a half weeks heading west from Chicago, our 10 days on the NW coast felt very different. This was partly due to having reached such obvious geographical milestone but also because our first port of call – the Jedediah Smith Redwoods State Park – proved so wonderfully relaxing that we ended up spending three nights there, a luxury we hadn’t afforded ourselves anywhere else. Not that this was our initial intention. 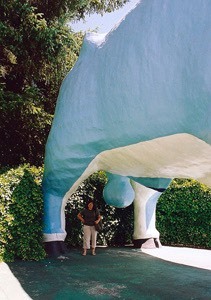 For as well as being an physical landmark, our arrival on the Pacific coast also proved a psychological one. My wife Carole is fascinated by the ‘idea’ of bears but terrified about the possibility of actually bumping into one. The thought of them had preyed on her mind ahead of visits to Yellowstone and Glacier so my suggestion that we book into the Jedediah Smith campground just off Highway 199 was greeted with less than 100% enthusiasm. However, five minutes looking around the ground and the sight of dozens of young, unconcerned and clearly unmauled children convinced her that this was the place where we could finally unpack the tent we’d brought with us from the UK. 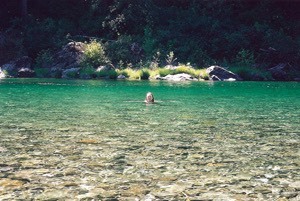 And an hour or so later, after unloading our provisions into the bear-proof box and diverting her attention from the sign warning that a bear had been seen on site recently, we were sitting by – or in my case, swimming in – the Smith River. 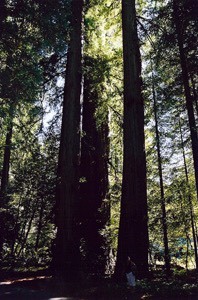 The 10,000 acre park was established in 1929 and is mainly old growth redwoods, huge trees whose gradually tapering shape makes them appear even bigger than they already are. Walking through the woods we both felt the need to reach out and pat the largest specimens in much the same way you would a dog or a horse; never before have I been among trees that were so apparently living things. Back in 1963 I went ‘wow’ when my dad drove the car through the hole that had been ripped through the base of a 2000 year old giant; we live in a different world today. The river itself, the last major free flowing river in California, is cold and can be treacherous but it’s also beautifully clean and lined by unspoilt woods so just demanded to be swum in. We loved it here. Day two and after driving into Crescent City we finally see the Pacific. Or rather we don’t, because it’s hidden by thick fog. The helpful lady at the tourist office suggests a trip to Crescent Beach Overlook a few miles south, which proves as pointless a diversion as it sounds given the conditions, but makes up for it by also recommending the wonderfully named Trees of Mystery just north of Klamath. The first thing that greets you here is the world’s tallest Paul Bunyan (49’ 2”) and his impressively anatomically-correct bull. Photos duly captured, we enter into the Trees of Mystery, a short wilderness trail that takes you past a series of redwoods that have grown to great heights (up to 297’), to impressive ages (almost 2000 years) or in unusual shapes (the Cathedral Tree forms a small chapel where weddings are held). At the risk of sounding a killjoy, the mystery often lies is working out why one tree has been assigned a name and not another, but it’s as good a place as any to appreciate the majesty of these forests. Plus the walk leads you to the Sky Trail, a gondola ride through the forest canopy to an observation deck which, had it not been for the fog, would no doubt have revealed spectacular views. Sadly, having enjoyed quite possibly the worst night’s sleep ever, the rest of the day was dedicated to the acquisition of pillows, an inflatable mattress and a battery-operated pump. Oh, and frying pan, sharp knife, night light, olive oil, tomatoes, garlic, chilli peppers, avocado, wine, cold beer, ice and pasta. Hell yeah, we know how to rough it. Our final day in California proves something of a let down. Our initial plan to raft down the Smith is scuppered when we’re told that the guy who hires them out has only just come out of hospital so won’t open for the season until … tomorrow. So we decide to sit by the river and watch the world – if not fellow rafters – go by, but the sun’s gone in and it’s turned cold. Okay then, a trip to Safeways for more (yes, more) provisions. But Carole slips on spilt oil in the car park and sprains her ankle. The store manager explains that the car park has nothing – absolutely nothing – to do with Safeways but perhaps I’d like to buy a bandage and ice pack? Thanks, Doug. Back to the campground for a short walk and come across a pair of deer by the river. At first we amaze ourselves with our backwoods skills as we crouch low and quiet in our efforts not to disturb them. Minutes later they show equal lack of interest in the noisy family that walks but no more than 15 yards away. I guess they’re just used to living next door to the campground. Back on the road today and, after a huge breakfast by the harbour in Brookings, we point the wheels north on Highway 101 and sit back to see what Oregon has to offer. And it’s every bit as good as people had been promising it would be. There are countless stopping off points offering stunning cliff-top views over today’s slightly less foggy Pacific. It’s a craggy coastline and a photographer’s paradise. Whaleshead Beach, where we walk/limp off our respective breakfasts, is typical, with a pristine grey sandy beach, huge lumps of bleached driftwood, softly crashing surf and picturesque rock stacks just a little way offshore (although we didn’t see the sea spout that gives this beach its name). A few miles north, just south of Port Orford, the Oregon Coast Highway passes beneath the gaze of large green Tyrannosaurus Rex, strategically sited to ensure that anyone with kids onboard has no alternative but to stop. And those without kids too. T-Rex is just one of 20 or so life-size dinosaurs created in concrete, and then painted in vivid colours, by sculptor Earnie Nelson. 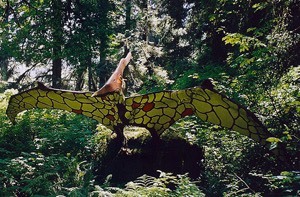 Their home is Oregon’s Prehistoric Gardens, set in a genuine rainforest, and it’s a roadside attraction that has been charming visitors for over 50 years. An hour or so further on we decide that 120 miles is enough for today so book into the conveniently located Inn at Old Town Motel in Bandon, directly opposite the renovated Old Town and harbour area. Bandon’s one of those places that’s had to reinvent itself as the old industries of logging, fishing and cranberry production give way to tourism, boating and sports fishing. And while it’s undoubtedly a charming place, you do wonder just how many more galleries, gift shops and arts & craft outlets it can support. On the positive side though, we enjoy our first cup of Yorkshire Tea (the best in the world!) in weeks, having had our attention drawn to one particular tearoom by the presence outside of our first ever car, an old black Morris Minor 1000 (go on, Google it). We also enjoy one of our best meals of the trip at The Wild Rose Bistro, a husband-and-wife owned restaurant serving such delights as halibut with a pistachio crust and sturgeon wrapped in pancetta. 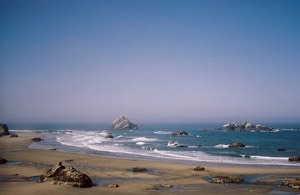 Best of all though is Bandon’s beach, recommended to us by the owner of the tearoom. With no obvious signposting and involving a drive back out of town, through a residential area and past local schools, it’s almost as if Bandon wants to keep it secret. But a quick view over the cliffs in the afternoon convinces us to spend a couple of hours exploring it properly the next morning. It’s wide, empty and incredibly photogenic, featuring on every tourist guide, calendar or coffee table book connected with the state of Oregon. There are rock pools, anemones, starfish colonies, wonderfully clean and smooth sands (perfect for those with a bad ankle) and those amazing sea stacks rising out of the water. Every day should start like this. Continuing up the coast and the scenery changes from rocks and crags to sand dunes. This part of the coast is definitely a destination in its own right and you do stand out from the crowd if you’re not towing or riding a dune buggy. The sheer scale of the dunes also means you lose those views of the sea for much of the time unless you turn off to take a walk in these soft, powdery sands. A break for lunch in Florence and our next stop is Sea Lion Caves, home to a large breeding colony of Stellar sea lions. At first it seems wrong to have to pay to see animals in their natural environment but it’s actually worth the entry fee as this includes a 208 feet elevator ride right down into the cave itself. You may find that there’s a short queue for the elevator. Take this opportunity to scan the surface of the sea far below and you may be lucky enough to see a gray whale spouting no more than a hundred yards or so from the cliffs. Seeing your first ever whale is something you’ll never forget. We did and it made our day. As well as getting you fairly close up to the sea lions, the elevator ride means you also get to enjoy the sound and, yes, the smell of these marine mammals. 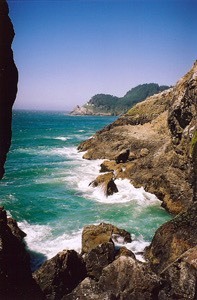 And at the other end of the cave there’s a superb view of the nearby Heceta Head Lighthouse. Heading back north again and the coastline begins to get busier by the mile in terms of both traffic and conurbations. Newport had been our back-of-the-mind destination but looked so busy and, to be honest, thoroughly commercialised that we drove on without stopping. You never get to find out whether these decisions are right or wrong but it’s hard to imagine Newport matching the charm of Depoe Bay. Famous as the world’s smallest natural harbour, this compact little town remains an active fishing port and the experience of standing on the bridge that spans the narrow entrance to the harbour and watching the boats battle their way in and out is one not to be missed. Other attractions include a resident pod of grey whales and coastal lava beds that create ‘spouting horns’ of sea water up to 60’ high in rough weather. Sadly for us, the whales were hiding and the weather was good. We also managed to miss – by no more than five minutes we were told – the nightly entertainment provided by Gracie Strom, owner of the Sea Hag bar/restaurant, as she hammers out her favourite tunes on the bottles behind the bar. 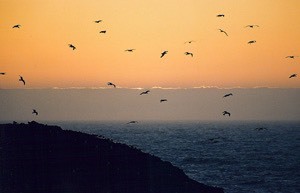 The word that best sums up Depoe Bay is ‘charming’. It’s probably not a place for those looking for excitement, or indeed more than a couple of days’ entertainment. But it’s small, welcoming and unspoilt, somewhere we felt very much at home. From here the 101 moves inland for a while, past the 3 Capes Scenic Drive (which we gave up on as resurfacing work made progress so slow) and Tillamook (possibly the only place in the world famous for both cheese and aircraft), before once again passing through sandy seaside communities. Today’s plan had been to drive on up to the Olympic Peninsula and spend two or three days there with maybe a whale-watching trip built in. But the beauty of having no hotel bookings is the freedom to change your mind. So, after crossing the impressive, 4.1 long Astoria-Megler Bridge and stopping at Chinook, WA, for a lunch of oyster burger (served by our wonderfully eccentric waitress Wilma who seemed genuinely disappointed that we'd never met the Queen), we make the snap decision to backtrack over the bridge and head east on Highway 30, following the Columbia River towards Kelso … and the promise of Mount St. Helens tomorrow. From our Kelso base, Mount St. Helens is an easy drive along the Spirit Lake Memorial Highway (SR-504) so there’s plenty of time to stop at the various visitor and information centres on the way. This, and the many viewpoints along the route, helps build the tension ahead of seeing something that had such a devastating impact on North West America, and went on to affect the weather systems of the entire northern hemisphere. The mountain exploded in May 1980, flattening 230 square miles of forest with its super-heated, 300 mph blast and choking lakes, rivers, roads and cities with the ash that was thrown 15 miles into the sky. Given figures like this, the piles of leaflets you pick up on the way and the giant screen ‘Eruption of Mount St. Helens’ movie that you can watch before your arrival, you’d expect to be pretty much prepared for the impact it has. But you’re really not. Mount St. Helens is awe-inspiring. A huge mountain with its entire northern side blown out, surrounded as far as the eye can see by long-dead trees with their withered roots pointing towards the epicentre of the blast to create the world’s biggest crop circle. And it’s still active, smoking away happily and, as we discovered on that evening’s local news, generating earthquakes as recently as 05:00 that morning, the sixth in as many days. 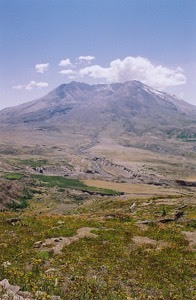 We haven’t heard the last of Mount St. Helens. I could go on forever. It was right up there with the North Dakota Badlands, Yellowstone Lake and the Going-to-the-Sun Road in Glacier National Park. All I can say is that you ever get the chance, go. And as a fascinating footnote for British visitors, it is named after (or ‘for’ as they say in the States) one Alleyne Fitzherbert, 1st Baron St Helens, by his explorer friend George Vancouver (whose own name has been applied to at least two cities and one island). And yes, it’s the same St. Helens that you associate with rugby league and glass manufacturing. Our final destination was Seattle, a place that had a great deal to live up to. At the beginning of our journey we’d taken to Chicago in a big way. We’d then fallen for the empty spaces of the northern states and the friendliness of the people. And the natural beauty of the redwoods and the ruggedness of the Oregon coast had taken us by surprise too. We now had the best part of three days to spend in Seattle, surrounded by hustle and bustle for the first time in weeks, removed from the cocoon of our rental Chevrolet TrailBlazer and painfully aware that it was nearly all over. But Seattle was up to the challenge. The restaurants – Campagne, Virginia and Le Pichet– were all outstanding; Space Needle is a must; and the EMP (Experience Music Project) definitely worth a visit, especially for the exhibits on locals like The Kingsmen, Jimi Hendrix and Nirvana. 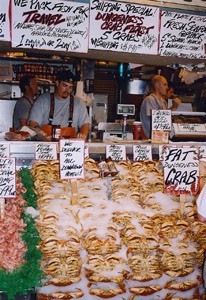 Pike Place Market is as colourful, loud and lively as you’d imagine from all those city break travel shows you’ve seen. The flower stalls are amazing. The buskers are friendly and usually in tune. And yes, the guys in the fish market do put on a non-stop performance. Equally quirky is Smith Tower, Seattle’s first skyscraper and an ideal viewpoint from which to look out over the city and away to Mount Rainer, the 14,410 ft jewel of the Cascades that dominates the skyline to the southeast. Smith Tower was built in 1914 and the original elevators – all brass and copper – are still controlled by uniformed operators. The observatory is located on the 35th floor and those uncomfortable with heights or perhaps still suffering from ankle pain might prefer to stay inside rather than getting in everyone’s way by making unsuccessful attempts to brave the open air observation deck that wraps around the building. And even if you’re not one for guided visits, Bill Speidel’s Underground Tour is worth the bad jokes for which the guides are renowned. Seattle was originally one storey lower than it is today and a combination of high tides and poor sewer systems would often wreak havoc. The city’s solution was to raise the roads and sidewalks by one storey, effectively turning the first floor stores into dingy basements which were soon populated by rats, gamblers and ladies of the night. Closed down and locked off many decades ago for fear of disease, the Pioneer Square underground was ‘re-discovered’ in 1964 by the enterprising Bill Speidel, who started organising visits and whose company has done so ever since. So, yes, while there definitely was a slight end-of-journey cloud hanging over us throughout our stay in Seattle, it lived up to its promise as a vibrant and exciting place and was somewhere I’d recommend without reservation (not least for its food). On this section of our trip we covered 741 miles over five driving days, with non-driving days doubling the time we spent on the coast. We didn’t have time to visit Gold Beach, Coos Bay or Tillamook, let alone places like Crater Lake, the Olympic Peninsula or Mount Rainier. We could have spent 20 days and still seen only a fraction of what the North West coast has to offer. So if I have any advice for other road trippers it’s simply this: however much time you have, there are always, always enough attractions to fill it. If you’re worried you might get bored, it’s you, not your trip. More photos from this trip here.